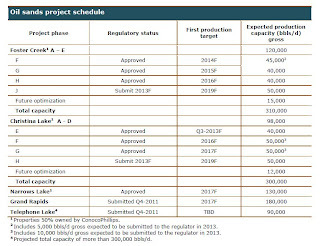 Here's a table showing planned expansions and new developments by Cenovus. If they all come about (and no other companies grow by similar amounts) I think it would easily make Cenovus the biggest oilsands producer (mining or in-situ) at over 500,000 barrels per day. 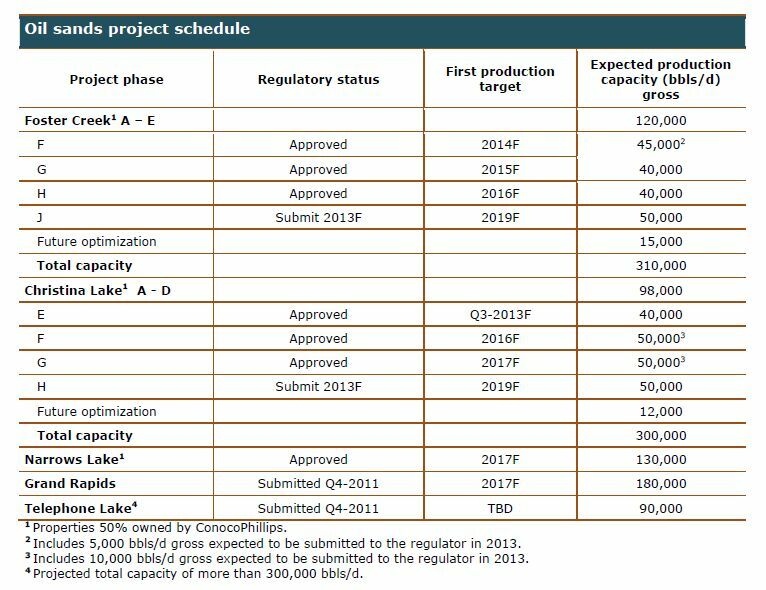 Note that the biggest currently operating in-situ project is Foster Creek at about 120,000 barrels per day, closely followed by Imperial's Cold Lake project at about 110,000. These expansions, taking both Christina Lake and Foster Creek above 300,000, would be breaking new ground in terms of project scale. My gut feeling is that the expansions are ambitious, but believable. Similarly, Narrows Lake sounds pretty promising. I'm not quite as sure they're ever going to be getting 180,000 barrels per day out of Grand Rapids/Pelican Lake though. I also can't really picture 90,000 out of Telephone Lake when as far as I know they're still struggling to find a partner for the project, and the if it was such a promising prospect someone would have jumped in by now. Hopefully time proves me wrong! I think it would be great to have an undisputed Canadian leader in the oil sands.